It’s been a while since Duke University Political Science Professor, Jerry Hough, kicked off a sh*t storm of commentary by offering a bluntly racist critique of the New York Times article, How Racism Doomed Baltimore. The Times piece is an excellent take down of entrenched poverty among Blacks in Baltimore, describing the collapse of Baltimore’s inner-city as the nexus of a history of racial coding and legal restrictions, social exclusion, white flight, inequitable public policy, and straight-up financial chicanery, suggesting that these conditions contributed to the world weariness and anger behind the unrest we were witness to following the death of Freddie Gray. The article tacitly warns us that the problem of structural racism in Baltimore (and in urban centers across the country that have been similarly victimized) is one that we would be unwise to dodge via racist rationalizations about cultures of poverty. The blacks get awful editorials like this that tell them to feel sorry for themselves. In 1965 the Asians were discriminated against at least as badly as blacks. That was reflected in the word ‘colored.’ The racism against what even Eleanor Roosevelt called the yellow races was at least as bad. So where are the editorials that say racism doomed Asian-Americans. They didn’t feel sorry for themselves but worked doubly hard. I am a professor at Duke University. Every Asian student has a very simple old American first name that symbolizes their desire for integration. Virtually every black has a strange new name that symbolizes their lack of desire for integration. The amount of Asian-white dating is enormous and so surely will be the intermarriage. Black-white dating is almost non-existent because of the ostracism by blacks of anyone who dates a white. In the world of social media, weeks often feel like years but after re-reading Hough’s rant I just couldn’t resist responding. Professor Hough is a research professor in political science, after all, and a Brookings Institution Senior Fellow. And while Duke is a private university, it is number ten among universities receiving federal support for research and development. I’m not paying for this guy’s public platform without comment. So with that in mind, let’s sort out this twisted history. …[Hough] disingenuously ignores the uniquely oppressive circumstances under which African-Americans arrived in the United States. While other groups experienced hardships in the course of immigration, no other population came to this nation as chattel property. And then there was the corrosive legacy of segregation, Jim Crow and broad-based discrimination that continued long after the end of slavery, and that still overshadows black life in America today. …There are so many ways that this kind of praise [of Asians] is actually damnation. For a start, it suggests that assimilation and cultural erasure are the only means to succeed in America. It dismisses those who don’t succeed in the precise ways that white America defines as success as failures, and blames them for their inadequacy and laziness. And it sets America’s striving masses against one another — dividing communities that should by all rights be finding common cause and fighting shared ills. The net effect is that in times of unrest, anger is redirected away from an unjust establishment and toward closer and more immediate targets for rage. Eric Garner, Miriam Carey, Shelly Frey, Freddie Gray, Yvette Smith, Michael Brown, Timothy Russell, and Timothy Stansbury, Jr., all Black, and all killed by police while unarmed, had traditional Anglo-American names. In fact their Anglo last names are were very likely imposed originally on their ancestors in order to mark them as property – a distinctively Anglo-American tradition. Meanwhile, I was given the first name, Scot (with one “t”), by a woman who wished me to grow up to be tall, fair, and handsome like a Scotsman. At 5’7″, tan, and not at all Scottish in appearance, I’m going to say that didn’t work out as planned. However, it did do a job on my self-esteem when, as a kid, I realized my mother hoped I would grow up to look like a white guy. Of course, I can hardly blame her. In her grade school years, her sister, brothers, and any number of friends and more distant relatives, were forced to adopt Anglo-sounding first names as shields against the persecution of Japanese Americans during WWII. This kind of forced assimilation is something Asians in the U.S. share with Native Americans who were not just forced to change their names, but made to attend brutal boarding schools meant to “kill the Indian” in them, and that only after white settlers had actually killed so many “Indians” that many Native Americans were unable to muster effective resistance to having their children taken away from them and abused in this manner. So much for the glories of assimilation. Professor Hough also mistakes casual observation of Asian American life on the Duke campus with social science. Where intermarriage is concerned, Asian Americans may lead the pack when it comes to marrying whites, but we are also the only group among all races where the growing general trend toward intermarriage is actually reversing itself. Increasingly, Asians are marrying Asians, probably because there are so many more Asians in the United States with each passing year. This reverse trend makes Hough’s theory – that we’re marrying across race in order to assimilate – a bit suspect. But that’s just the beginning of what’s wrong with Professor Hough’s take on history. In 1965, the year the professor references as a bad time for Asians in America, the Immigration and Nationality Act ended racist restrictions on immigration to the U.S. from Africa, Latin America, and Asia (a change owed in part to the racial awareness inspired among Americans by Black leadership in the Civil Rights Movement). However, the Act didn’t throw open the doors to all immigrants. Instead, the Act imposed preferences intended, in no small part, to deal with labor shortages. The shortages included those created through the combination of the Vietnam War and the establishment of Medicaid and Medicare (also enacted in 1965). The war created a shortage of doctors and medical technicians, engineers and other highly skilled technical workers in the U.S., while Medicaid and Medicare radically expanded the demand for medical services. One of the ways we dealt with those shortages was by loosening up immigration laws to facilitate recruitment from abroad, especially Asia. Because of market-driven immigration reform, today’s Asian American community is 74% foreign-born, and while that number is big, it doesn’t include American-born Asians whose families immigrated after 1965. In 2012, the Pew Research Center reported that 61% of new immigrants from Asia between the ages of 25 and 64 had college degrees. Moreover, 27% of new Asian arrivals had employer sponsors. So, yeah, Asian immigrants often (though certainly not always as in the case of Southeast Asian refugees of war) have a huge advantage as they enter the U.S. And that advantage is no small thing when compared with the disadvantages faced by Blacks, many of which are described in the Times article Hough critiqued, especially because those disadvantages are amplified by straight-up anti-Black prejudice. A Center for Economic and Policy Research report cited by the New York Times indicates that recent Black college graduates ages 22 to 27, suffered a 12.4 percent unemployment rate. That’s versus 4.9 percent for similarly qualified whites. Many have claimed that this extraordinarily high rate of unemployment is not a result of employer racism. They blame structural racial disadvantage in primary and secondary education which, they say, makes Blacks less prepared for college, less likely to do well once they enroll, and far less likely to be accepted by the most prestigious schools. But none of that rationalizing explains this: the unemployment rate of recent Black college graduates is worse than for Blacks overall (less than 12 percent). So much for Professor Hough’s belief that a good work ethic = success. Jerry Hough is entitled to his opinion, and nothing in academia is politically neutral. But using his status as a Duke University faculty member to give weight to his specious claims? That’s just academic malpractice. 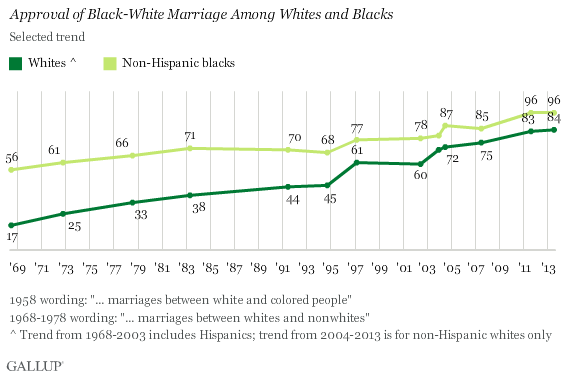 A majority of Black Americans have approved of interracial marriage since at least 1968. In contrast, Whites don’t achieve majority-approval until 1997. In ’68, 56% of blacks approved. Whites? A mere 17%. Today (2014) Whites have improved to 84%. But they are still behind Blacks, who log in at 96%. Hough’s thesis is bunk, as we all figured…but seeing the actual data really brings the point home. Thank you. I can always rely on you for data. Thanks, Scot, for another great read! Just wanted to say I really enjoy and learn from your analyses of racial stereotypes–an area I’m currently looking into myself. Thanks, Nayoun! And thanks for reading and commenting. A sidenote: I understand (from J. Otto Pohl, an academic who writes about the Soviet Union) that Hough is also an apologist for Communism, and denies a large chunk of Stalin’s murders. To be wrong about American Racism and the USSR is quite a feat, I would say. Wow. That really is quite a feat, though I think it speaks to how racism, xenophobia, and bigotry in general, not to mention repression, corruption, etc., aren’t the exclusive purview of the right or the left.